The usual dose of clindamycin in dogs is 5 mg per pound (11 mg/kg) every 12 hours or 10 mg per pound (22 mg/kg) every 24 hours orally. For cats the dose of clindamycin ranges from 2.5 mg per pound (5.5 mg/kg) every 12 hours orally to 10 mg per pound (22 mg/kg) every 24 hours orally. The dose and frequency depend on the type of infection treated. 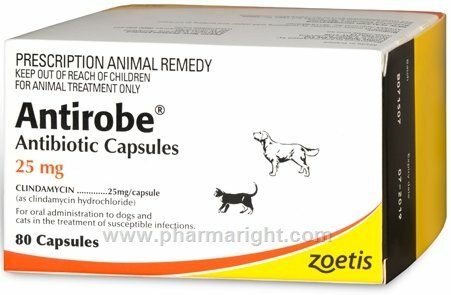 In both dogs and cats, clindamycin pill should be given with small amount of water after to encourage the pill to enter the stomach. This is to prevent esophageal injury which can occur from a dry pill sitting in the esophagus. See specific information for each form on its own product page on our partner site.